About 3600 persons and items related to African-American, African, and Caribbean cultures are covered in this book. Finally, there is a brief biographical index at the end of the book which provides quick information about approximately1900 of the individuals included in the word search puzzles. This is a very valuable resource and is an excellent catalyst for youngsters to continue more in depth research. And, of course, if not interested in that feature, they can just enjoy the puzzles. These puzzles are for children and adults of all ages. One of the nice things about Black History Month is that we get exposed to a concentration of Black oriented art and literature. But after that, we often face a drought. 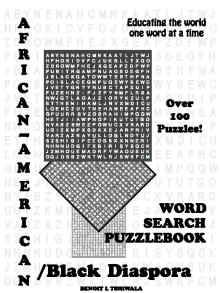 As this puzzlebook shows, there is enough African American culture to last year 'round. "Puzzle book is perhaps not the best description of this book. Rather than a small, hand-sized, paperback that you might slip into a briefcase or purse, it appears more like an education workbook; spirally bound with 8.5" by 11" pages standing almost 2" thick. Its pages seem particularly suited for detachment and photocopying as if part of a school lesson on black culture. "Some of the themes would be perfect for the TV-show Jeopardy (you know, when it has that Black/African History column) such as "Winners of the Tony Award," "Top Women Architects," and "Jazz Immortals." Lest these puzzles be labeled stodgy, it should be noted that "Ten at the Top of Hip Hop" and "TV Hunks" are among the more than 100 puzzles found within. The book also has sections devoted to African-American culture as well as African culture throughout the world." Mr. Tshiwala was a language teacher as well as a linguist by academic training. He was a graduate of Lovanium University (Democratic Republic of the Congo, Central Africa), Georgetown University (Washington, DC), and the University of Illinois (Urbana-Champaign, IL). His interest in puzzles went beyond mere entertainment. He believed that, given careful planning and organization, word games could greatly enhance the quality of teaching materials by helping to captivate the learner's attention. Mr. Tshiwala passed in the Winter of 1999.